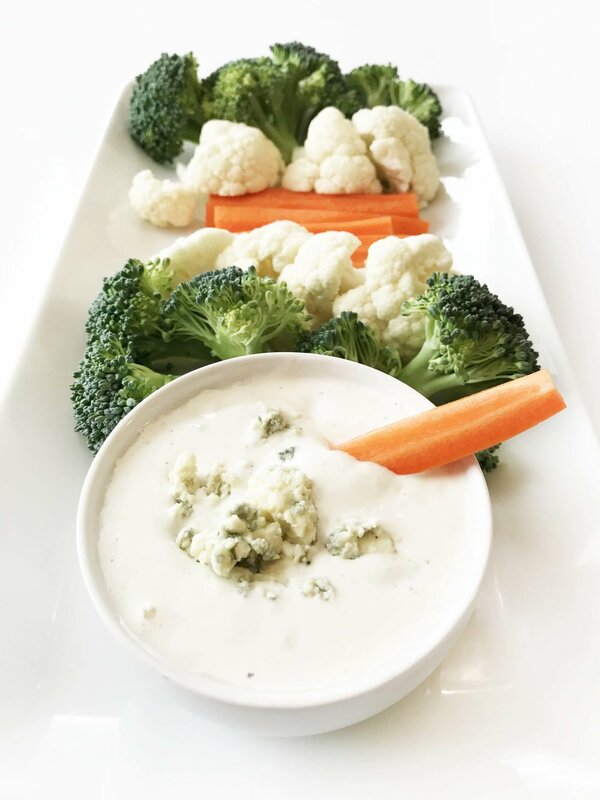 I've been trying for years now to create a perfect blue cheese dressing/dip. I think that I've gone through a good ten different recipe variations by now, and none of them have really stuck. None of them were to the level that I wanted. None of them impressed me... until now. I had all but given up in my quest. But then, my desire... nay, my need for a good homemade blue cheese dressing started back up a couple months back when I went to dinner at one of my favorite places where they happen to serve a salad that's served with a gorgonzola-port dressing. Fast-forward to a few weeks ago when I got myself a fancy new electric fondue pot. I really wanted a good blue cheese dressing to use in some fondue mushrooms caps, so I got back to work. I managed to find a pretty simple looking and standard 'copycat' of the gorgonzola port dressing of my dreams. So, with a few minor healthy swaps and adjustments - tada! This Healthified Gorgonzola Port 'Blue Cheese' Dressing was born. It's creamy, delicious, and loaded with big beautiful crumbles of gorgonzola cheese. Which if you know anything about me by now, it should be that cheese is my Achilles' heel. Not only have I used this on a salad, but also in stuffing those mushroom caps I was talking about, but I've also used it on a salad and to dip fresh veggies in! So, as you can see, this Healthified Gorgonzola Port 'Blue Cheese' Dressing is dipable, dunkable, and perfect for dressing up a salad too. And I do mean 'dressing up' a salad. Because that added port wine makes this dressing all the more classy! Place the 1/2 C. Light Mayonnaise, 1/2 C. Plain Fat-Free Greek Yogurt, 2 Oz. Gorgonzola Cheese Crumbles, 1/2 Oz. Reduced Fat 2% Milk, 1/4 Oz. Port Wine, and 1 Tsp. Minced Garlic into a medium bowl and stir together to combine. Season with salt and pepper to taste.